If you haven't had the opportunity to watch this video yet, it's a beautiful stop motion that makes a simple and inspired statement about the value of connectedness. If you're having trouble seeing the it below, click here to watch the video in a browser. So, with that image still in mind, I thought I'd a closer look at the local food system, as we're seeing a cultural shift towards community gardens and urban farming- people and neighborhoods going 'back to the start'. The connection between place, values, and sustainability is demonstrated in various ways through the implementation of these locally-based programs and efforts. As more and more empty and abandoned lots are transformed into active, productive neighborhood farms, communities begin to gain control of providing for themselves. 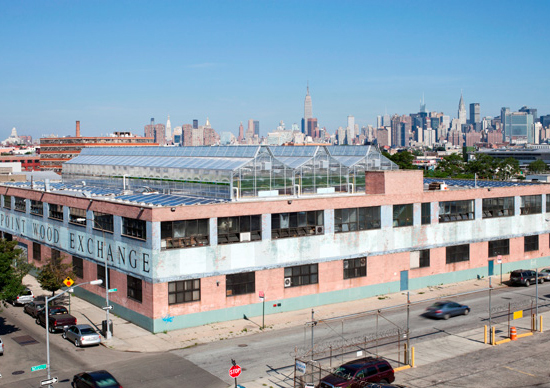 As more and more rooftops are becoming vibrant gardens, like this one in Brooklyn, Gotham Greens, healthier produce is available to urban communities that may have not had access to organic fruits and vegetables previously. In particular, Gotham Greens focuses on providing lettuces on a local level, and has not only created a healthy, regional food source, but is a model for sustainable development, incorporating technology such as hydroponic gardening methods to reduce water use by 20 times as compared to a similar traditional farm, as well as on-site power generation through the use of solar panels. For more photos of urban farming in New York, read this post at NRDC's Switchboard, and for further information on starting a garden in your community, or to view the growing global urban agriculture map, check out the project, Farming the City. Thanks for stopping by, and of course, happy Blog Action Day 2011!